Body: The body of the unit is constructed of high-density ABS plastic. The ring is sloped to the center opening of 8.5 inches. The edge of the ring is flanged to securely fit the top of standard Rubbermaid 32 to 55 gallon trash cans. All electrical components are housed in the protruding square on the side of the ring. 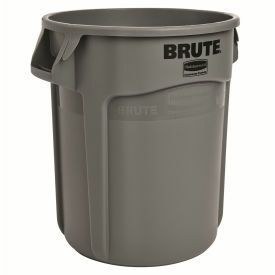 For Use On: Rubbermaid 32 gallon Brute Trash Can Height 27 4/5 Inches Diameter 21 9/10 Inches. Metal detecting coil: The metal detecting coil is securely fastened to the inner ring of the unit. 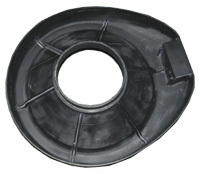 The coil is potted in an epoxy compound protecting it from both moisture and food particles. Digital Counter: The FRS Flatware Detector is the only Flatware Metal Detection System to incorporate a digital counter to assist in the monitoring of flatware loss. The digital counter can only be reset by management personnel with a security key. This unique feature not only helps in tracking flatware losses but also reinforces employee diligence to help in preventing losses during disposal of waste. Electrical Components: The electrical components are located in a protruding square on the side of the unit. All components of the electrical system are potted in an epoxy compound to keep them safe from moisture and food particles. Adjustable intensity: The intensity of the metal detection is fully adjustable, allowing each customer to fine-tune the unit for their specific flatware and kitchen environment. This will help avoid annoying false alarms. We believe this is a very important feature, because repeated false alarms could lead kitchen and wait staff to eventually ignore both the real and false alarms. The restaurant, hospitality, and institutional industries in the U.S. alone lose over 1 Billion dollars in flatware, ramekins, and metal utensils every year. Many of the more popular chains have reported annual losses of 8 to 12 thousand dollars per location. FRS detectors will save these industries the high cost of replacing flatware, ramekins, and metal utensils. These losses can be virtually eliminated with the use of the FRS garbage can flatware detector and Linen Wizard III Detector System. 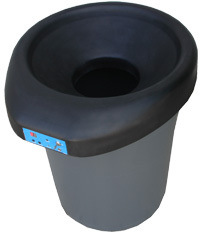 The FRS garbage can flatware detector has heavy duty ABS molded construction; it is water resistant and is designed to fit over a standard 32/44 gallon Rubbermaid or compatible garbage can. The FRS flatware garbage can detector alerts personnel flatware has been discarded, at point of loss, allowing for quick and easy retrieval. The FRS garbage can flatware detector is not a magnet; it is a precision metal detector. So, whether you have silver plate, 18/10 stainless, or less expensive stamped flatware you can be assured that nothing gets by the FRS Flatware Detector. The FRS linen Wizard III is an easy to use handheld metal detecting wand which can be passed around the exterior of the linen bag before removal. Sensitive enough to detect even a single piece of flatware or a single metal ramekin alerting personnel allowing for quick and easy retrieval before it is lost to your linen supplier. With a return on investment in as little as 30 days, there is no other purchase that can return so many dollars to a restaurants or food service area’s bottom line. The FRS system employs the latest in high tech materials and electronics. This technology comes directly from the latest innovations in the aerospace, security and metal detection fields. These units are patented and guaranteed. Years of research insure its reliability. Let’s stop dumping flatware into landfills and start conserving our resources and money. Together we can be good stewards of our environment. Body: The body of the FRS Flatware Detector is constructed of high-density ABS plastic. The ring is sloped to the center opening of 8.5 inches. The edge of the ring is flanged to securely fit the top of standard Rubbermaid 32 or 44 gallon trash cans. All electrical components are housed in the Control unit on the side of the ring. Electrical Components: The electrical components of the FRS Detector are located in a protruding square on the side of the unit. All components of the electrical system are potted in an epoxy compound to keep them safe from moisture and food particles.